We were pleased to chat about the work we had already done along with talking about specific areas and plans to take the campaign forward. I was pleased to have the opportunity to meet with officers from South Wales Police to look at the problem of inconsiderate parking and great to know that we’re not going to be banging our drum on our own. 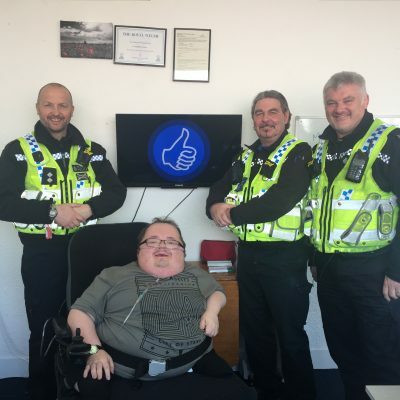 Accessible News are really pleased to confirm that the South Wales Police are going to be supporting the Considerate Parking Campaign; it helps a lot to know that the police are on board in helping to raise awareness of this problem. It is important to remember that blocking pavements, obstructing a dropped kerb and other similar parking infringements are not just problematic for people with disabilities but people with prams, pushchairs, shopping bags and walking sticks. Inconsiderate parking causes difficulties for everyone. We are delighted to work in partnership with Accessible News to promote awareness in the first instance, but also remind people that enforcement is an option if poor parking causes danger to any pedestrian or road user. For more information on our Considerate Parking Campaign please visit the campaigns section of our website (www.accessible-news.co.uk). Remember to keep a look out for more activity on our campaign over the next few weeks.